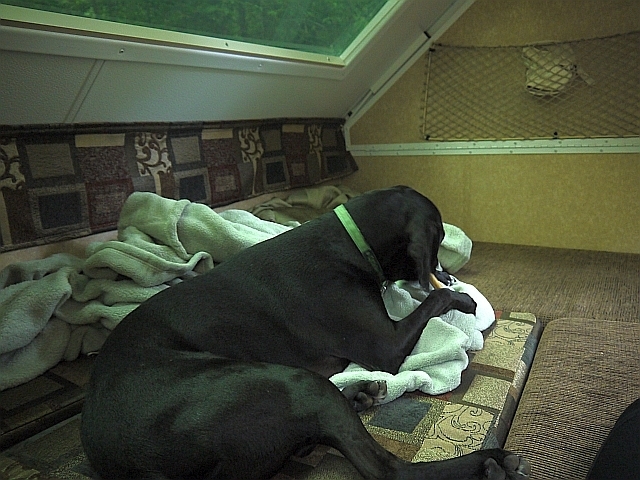 This past weekend seemed like a perfect time to take Fry on a local overnight camping trip to get him accustomed to the pop-up and also to see how he was going to handle the whole camping situation. 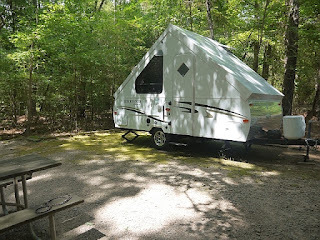 We chose Holly Point since it's a fairly short drive - on the off chance we needed to come home early for any reason - and close to some very pretty trails and the lake. Site 85 was nice and shady, with a large tent pad. 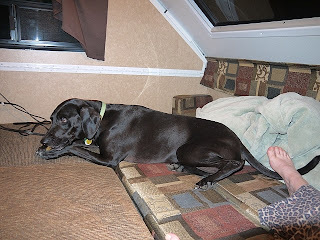 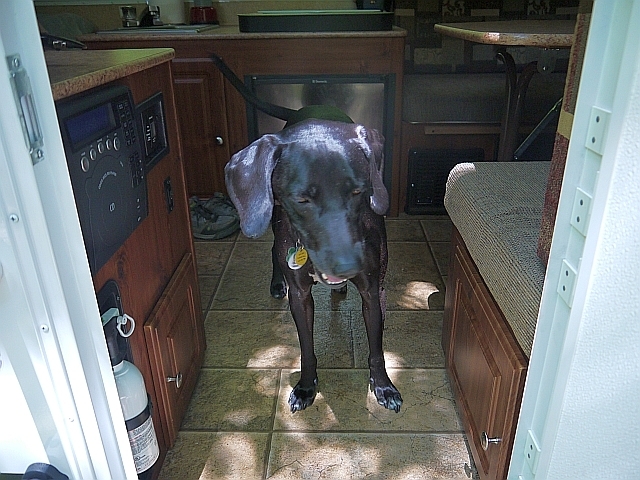 As soon as we got the camper set up, Fry eagerly jumped inside and was an adorable Welcoming Committee. Once we got everything unpacked, settled in and showed Fry around his "home" for the weekend, we then headed out hiking at a nearby trail. 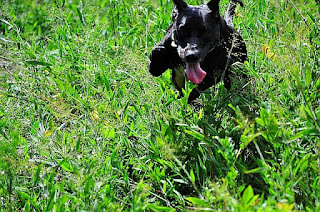 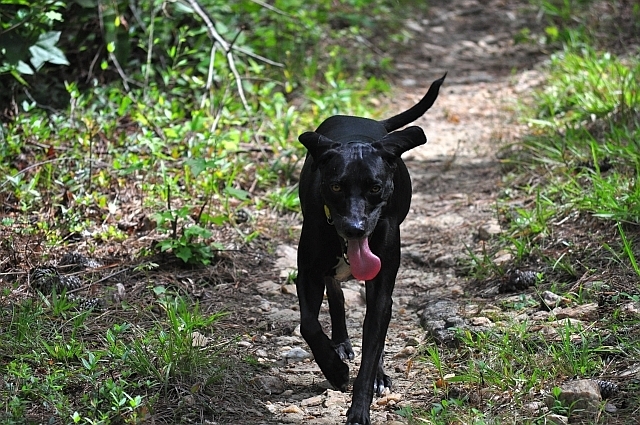 Fry had a blast, trotting along the trail, and playing in the tall grasses with his signature unbridled puppy joy. 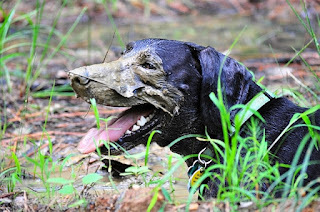 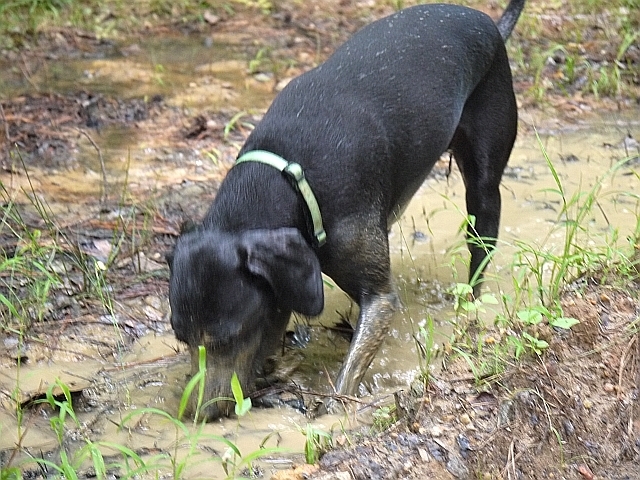 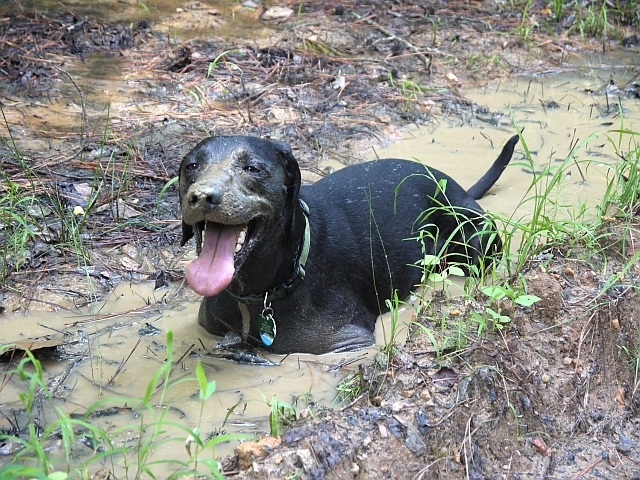 And on the way back to the trailhead, what doggy luck on a toasty afternoon to find a cool refreshing MUDHOLE!!! 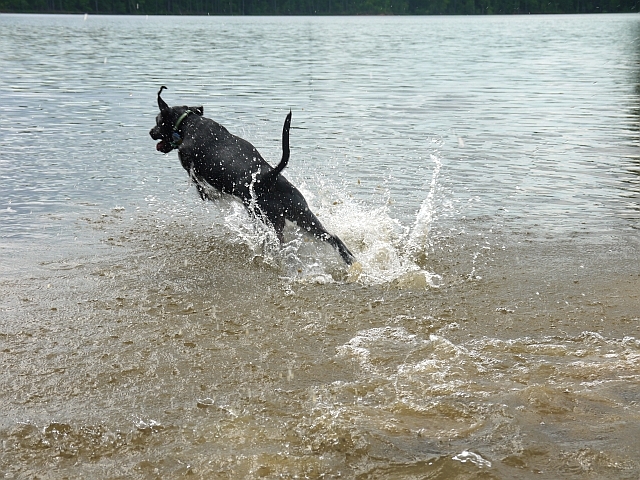 As much fun as it was for Fry to play in the mud, we didn't really want all that tracked back into the camper, so off to the lake we went to get him a nice rinse. Being the water-loving boy that he is, Fry happily obliged and dove right in. 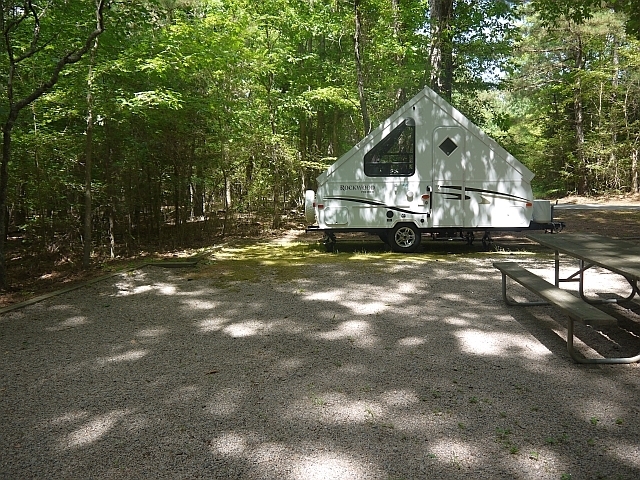 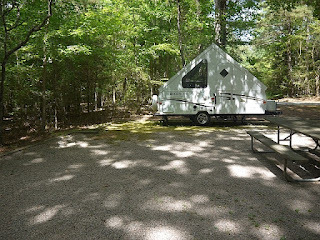 We arrived back at the camper where a tired little Fry flopped down on the bed in the air-conditioning while Steve and I took a short walk to check out the campground's swim beach and bathhouse. On our return, we were delighted to discover Fry had his "big boy manners" on and had behaved like a camping pro, napping quietly while we were gone. 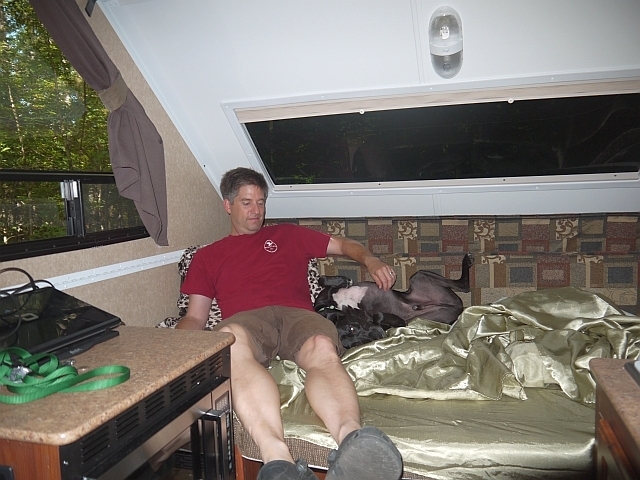 After cooking a yummy dinner on the grill, we all headed inside to eat and relax, with a beautiful view of the stars through the camper's skylight. Fry had already become quite comfortable in his home-away-from-home and settled in contentedly with a chew toy. 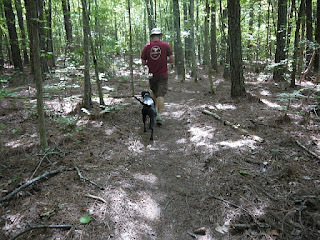 On awakening this morning, I took Fry out for a tinkle-walk and a short tour of our campsite loop. 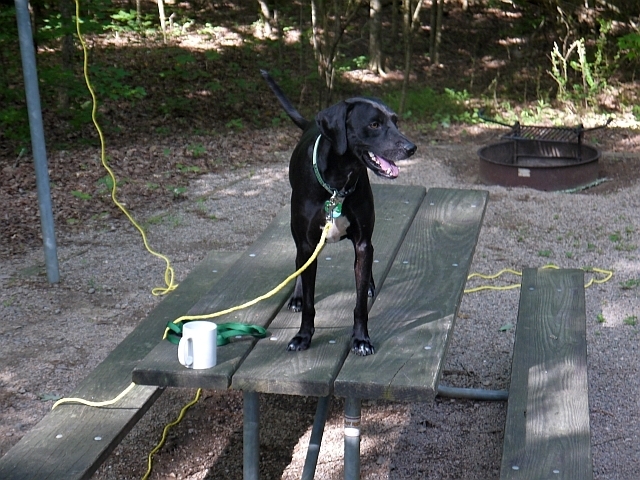 He was so good on his leash and continued to display excellent manners, including politely greeting the ranger who came by to empty the garbage cans at the campsite. 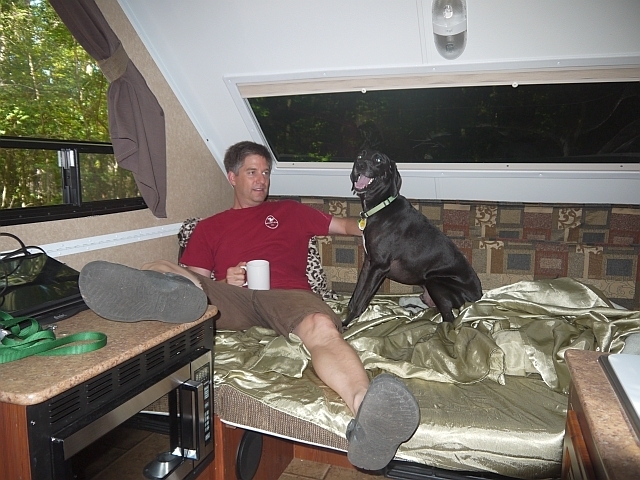 Fry kept an eye on Steve's coffee and supervised the preparation of both his and our breakfast. Then came inside with us and lounged on the bed while we finished our coffee. After finishing breakfast and showering, Steve and I took Fry for a longer walk around the campground, where again he politely and happily greeted everyone he saw with a friendly smile and wagging tail. 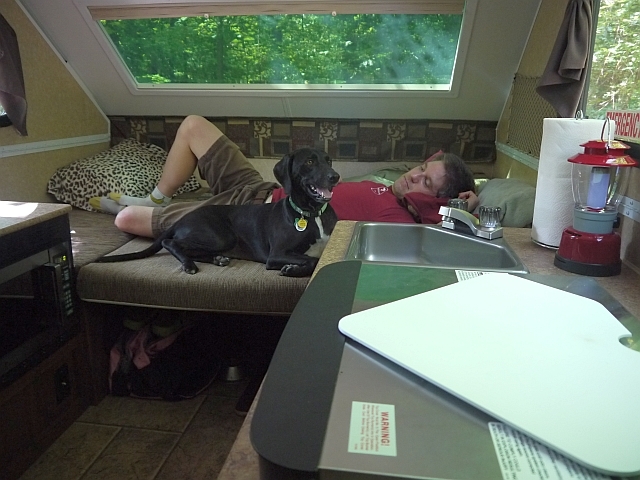 He seemed to be quite content and comfortable on this short trip, and we look forward to many more vacations with our little Happy Camper!